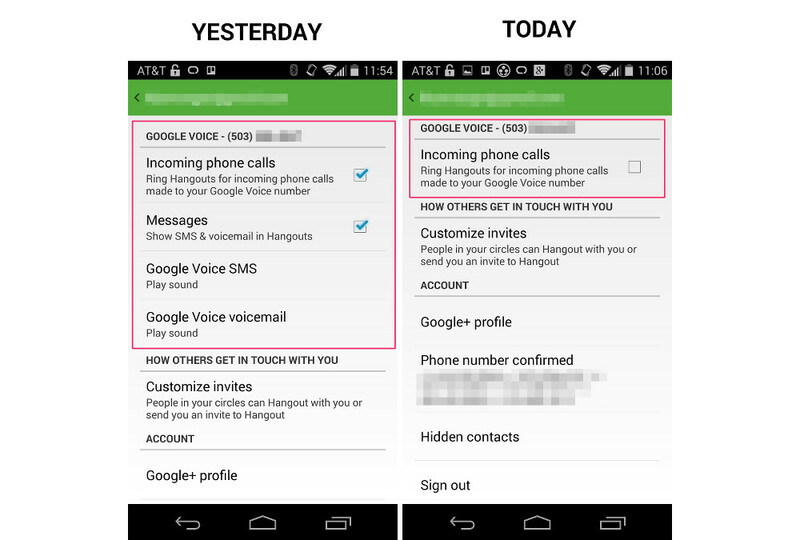 Yesterday, we talked a lot about the new Hangouts update that added in the ability to make voice calls. We also talked even more about how the service had finally merged with Google Voice. At least we thought it had. The night before the Hangouts update arrived, a number of users (us included) received a message in Hangouts and Google Voice, asking us to merge our experiences together. So, we did. Voicemails started arriving in Hangouts, as did our texting experience with a Google Voice number, along with semi-MMS support. It was a glorious time. Unfortunately, most of the world didn’t receive that “merge” message, so they were stuck with the separated experiences. If it makes you feel any better, know that the early merge adopters have all been reverted back, according to Google. As you can see in the image above from my phone, I am no longer seeing the Google Voice options that I was so excited about from yesterday. If you were one of the handful of people who saw the opt-in from the old Hangouts app last night, you’ve been reverted back to GV in preparation for the update. Don’t worry, you’ll be able to switch back soon. In other words, Google reverted those back who merged early to prepare for a full rollout, or something along those lines. That’s probably a good thing actually, since my merge experience included all sorts of force closes and an odd double-dialer experience when receiving phone calls. We are close, though. Hang in there, it’s still coming.